Humminbird announces the new ICE HELIX® 7 CHIRP GPS G2N – a complete, networkable fish finder pack equipped with an ice kit, along with a transom-mount transducer and gimbal mount for boat mounting and open water use. The Humminbird ICE HELIX Series has been a go-to choice for anglers looking to have an all-in-one ice unit with built-in GPS capability. Now, with the new ICE HELIX 7 CHIRP GPS G2N, anglers have access to leading fish finding and mapping technology year-round in one unit. The new fish finder is networkable with other HELIX G2N models and features GPS, CHIRP Digital Sonar, Humminbird Basemap and AutoChart® Live. Unlike traditional sonar, which operates at a single, constant frequency, CHIRP optimizes pulsing sonar signals for greater target separation. CHIRP provides more detail and clarity – ice anglers can now confidently see the separation between bottom, bait and fish on the screen, instead of all three blending into one color on their locator or flasher. This is critical in ice fishing when most species of fish are hugging the bottom, and being able to discern your lure from the lake bottom can be the difference between going home empty-handed or with a limit. The new ICE HELIX 7 CHIRP GPS G2N also features Humminbird’s easy-to-use Interference Rejection feature. Fishing with sonar on a busy lake can mean unwanted interference from multiple sonar signals in the water, which causes screens to be difficult to read. The Interference Rejection mode gives anglers confidence by letting them find the right sonar setting to cancel out competing signals, resulting in a screen that is almost completely void of noise. 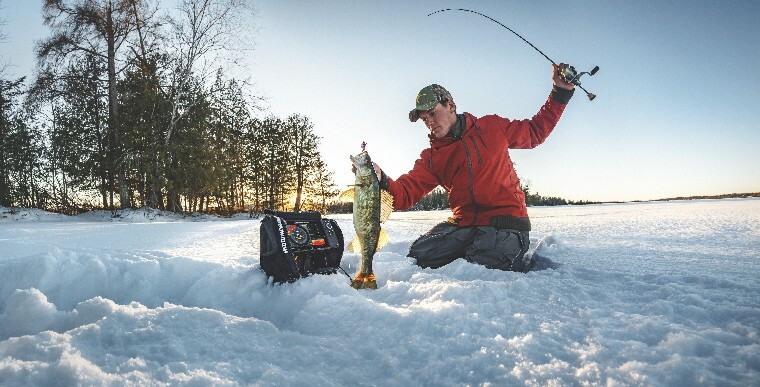 The ICE HELIX 7 CHIRP GPS G2N offers multiple screen views designed for the ice angler. Flasher view features a split-screen next to 2-D sonar, which lets anglers track the history of a lure and fish. Other views include Flasher/Sonar Zoom, Flasher/Chart, Sonar/Chart, and Sonar/Sonar Zoom. The viewing screen is ultra-responsive with a resolution that’s four times greater than flasher-only models and eliminates the humming sound that accompanies flashers, often used on the ice. The built-in GPS with Humminbird Basemap functions effortlessly with all Humminbird LakeMaster® or SmartStrike charts. These maps make the most of an angler’s time on the water, helping to quickly locate productive water and allow for precise waypoint placement on fishing spots. Humminbird Basemap is a pre-loaded mapping system that includes contour maps for more than 10,000 U.S. lakes. In addition to the built-in Basemap, the ICE HELIX 7 CHIRP GPS G2N is also equipped with AutoChart Live, which allows anglers to create real-time maps of depth contours, bottom hardness and vegetation while in open water, and access them any time of the year. It is also compatible with Humminbird’s new AutoChart LiveShare service which allows the sharing of AutoChart Live maps from anglers around the world. The ICE HELIX 7 CHIRP GPS G2N unit comes with everything an angler needs to go from ice fishing to open water fishing, including a CHIRP ice transducer and cable, an 800H x 480V color LED backlit display, a portable ice bag, battery and charger (9 amp-hour), a transom-mount transducer and gimbal mount for boat installation. The ICE HELIX 7 CHIRP GPS G2N will be available in fall 2018. For more information, call Humminbird at 800-633-1468 or visit Humminbird.com.